Remember the days when women's golf shoes merely mimicked of men's lines? All white and saddle styles ruled the world of foot fashion. Upgrades in comfort technology and the introduction of cutting-edge fashion elements have ushered in an era during which the Big Three in golf footwear -- adidas, FootJoy and Nike -- are going "golf wild" to make the five miles (18 holes) that women play a blisterless and stylistic trek. 1. Climacool Slingback -- You'll notice the open-heel construction that, with every step, fosters the in-flow of cool air allowing feet to breathe easily. This internal climate control is via a series of ducts, vents and perforations. A breathable mesh upper, tongue and linings enhance airflow while reducing frictional heat. 2. adiWear 3-Stripe -- The company's proprietary Z-Traxion system integrates z-shape lugs that combine lateral and linear grip for optimal comfort, stability and traction. It also maximizes the surface area in contact with the ground to provide better pressure distribution and elimination of hot spots. 1. CoolJoys Athletic -- Talk about toe-centric technology. The Competition Last promotes a full-rounded toe character, fuller fit across the forefoot and full instep with a slightly narrow heel. The shoe is athletically sloped from instep to toe. That's not all: a DuraMax rubber outsole provides impressive traction and durability; the midsole is super cushioned, and the uppers are made of mesh to optimize breathability when the weather heats up. 2. 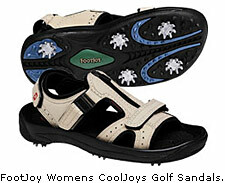 CoolJoys Golf Sandal -- Similar technology components as the CoolJoys Athletic model, however, this style features an open-air sandal for hotter climates. There are three adjustable Velcro straps and a zipper-closure system. 3. Europa Croc Collection -- You might as well be in Paris with the elegant styling found here. Check out the black-and-cream smooth bal waterproof leather wing tip, as well as the brown-crocco and white-flax floral prints. 1. Ladies SP5 -- Nike is king of the acronym here. First, its newly designed T@C (traction at contact) rubber outsole technology promotes stability, enhances flexibility and significantly reduces weight. Second, its Q-LOK Spike System means ease of snapping in cleats. Third, the LP (low profile) Scorpion Spikes are nestled into the grass to securely grip the turf without damaging the green. The ruby red color option is a head-turner. 2. 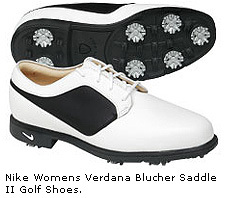 Verdana Blucher Saddle II -- Its supple full-grain leather with WaterShield waterproof membrane keeps feet dry. The heel air-sole unit in the innersole board provides responsive cushioning. Fashion-wide, the Veranda Collection is described by the company as a "blend of timeless contemporary/classic styles." The Nike swoosh is played down, too, as it's on the outside heel of the shoe. Make certain you keep an eye out for these women's golf-footwear up-and-comers: casual- and dress-shoe giant ECCO and snazzy Walter Genuin. 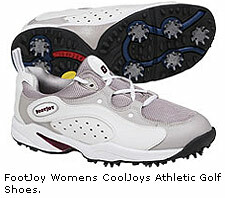 Mark Marney recently reported about men's golf shoes. He is CEO of The Golf Warehouse at tgw.com, the world's largest golf e-tailer. His columns highlighting emerging trends and golf products regularly appear at travelgolf.com.